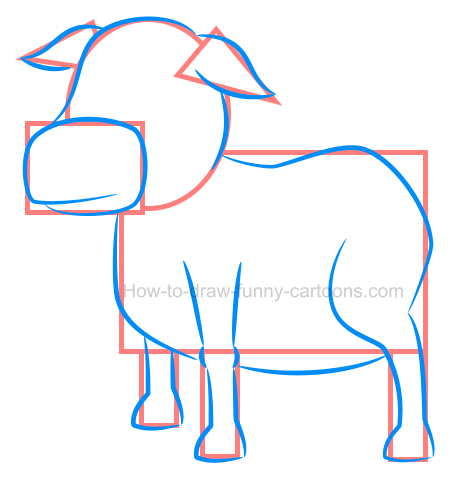 Let's learn how to create an illustration of a cow using basic shapes and colors and then see how drawing cool patches on the character's body can be tricky sometimes. Cows might not be the most motivating characters to create, but these adorable animals are still visually quite interesting to study. Unlike butterflies or cats, cows have some body parts that can be tough to duplicate. 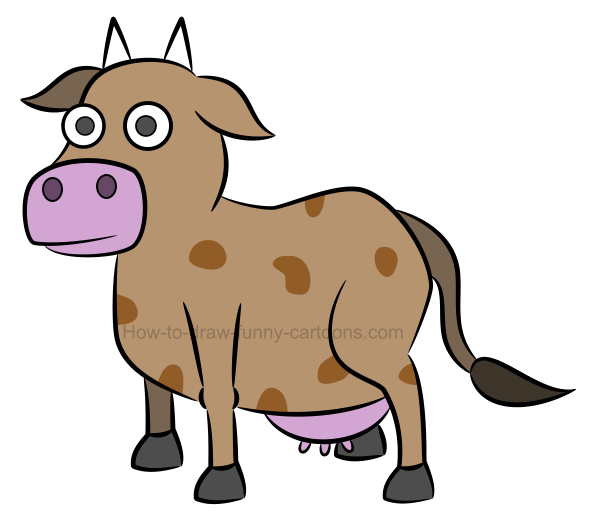 If you don't have much experience sketching cows, then it can be a good idea to take a look at the image above to learn more about this particular cartoon animal. 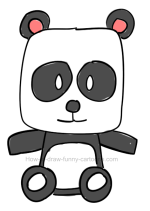 Indeed, some parts like the back legs or the head are made from complex elements not always easy to draw. Both ears are made from curved lines and are pointed near the end. Horns are made from small triangles added on top of the head. 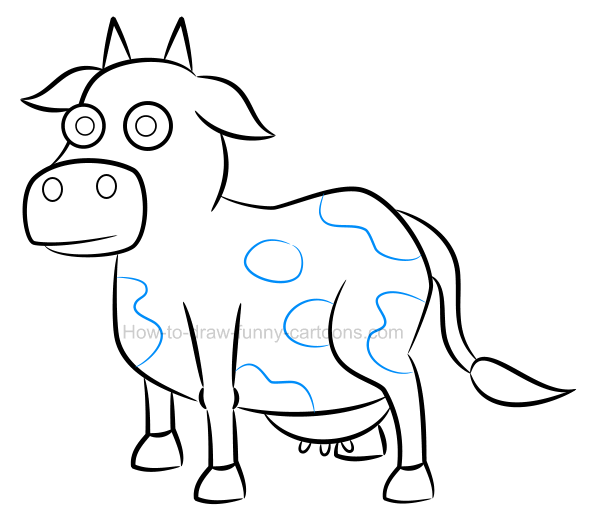 The back of the cow is irregular and done using a long curved line. The tail is thick near the body and thinner near the end. 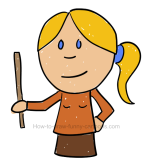 The tip of the tail is made from curved lines and is sharp. Hooves are large and filled with a dark color. The udder is located below the body and made from small curved lines. The body and the neck are strong and thick. The mouth is large and filled with a different color. Excellent! 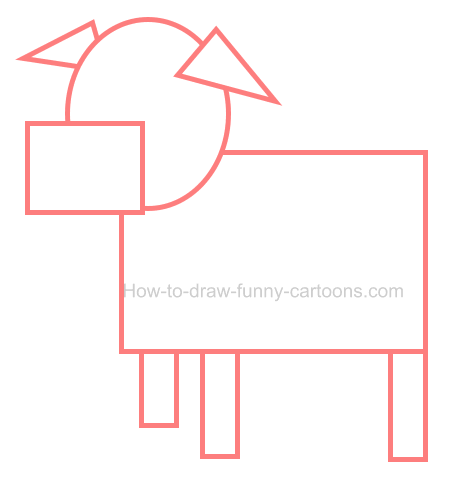 Now that we are more familiar with this cute cartoon cow, let's see how we can draw this one in just six easy steps using basic shapes, lines and colors. 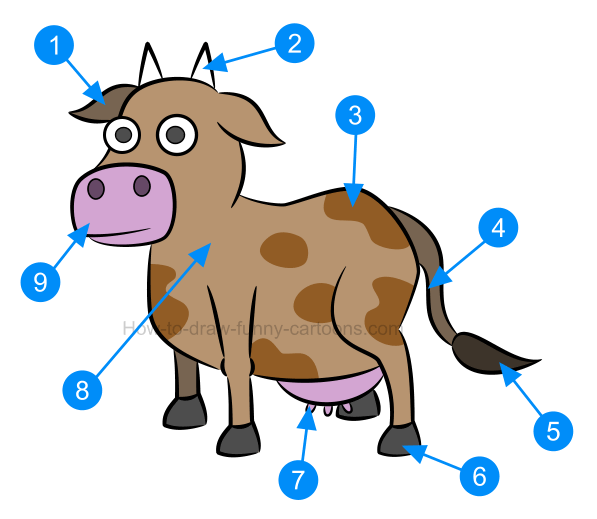 As you probably already know, I like to draw a few basic shapes to help us draw accurate proportions inside this illustration of a cow. 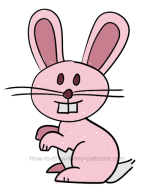 You can start by drawing a circle to form the head and two small triangles to create the ears. 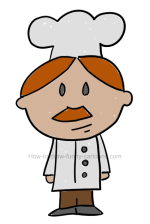 The mouth is made from a small rectangle while the body is done using a larger one. 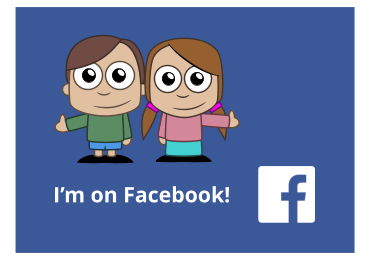 You can also add thin rectangles to represent the legs. 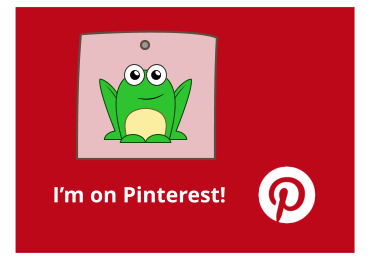 You can now use the template created in the previous step to sketch the animal. Pay attention to areas like the ears, the mouth, the head, the back and the hooves. The trickiest part is probably the back leg. Study this one carefully otherwise your cartoon cow might look a little awkward if this leg is not done properly. On top of the head of the cartoon character, sketch two large corns using broken lines. Make sure that the top of these new shapes is pointed. Then, draw the eyes using two medium circles. The pupils are also made from circular shapes. Finally, two small oval shapes are added above the mouth to form the nose. step 4 - Let's not forget the udder and the tail! 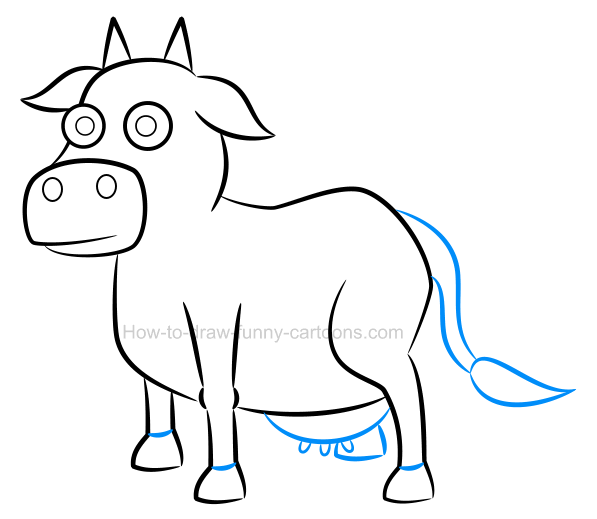 Behind this illustration of a cow, sketch the tail using two long curved lines and two smaller ones. Make sure the tail is narrow and sharp near the end. Then, you can draw the udder using a curved line. Don't forget to draw teats using small lines. Small curved lines are also added on all three visible legs to separate the hooves from the legs. 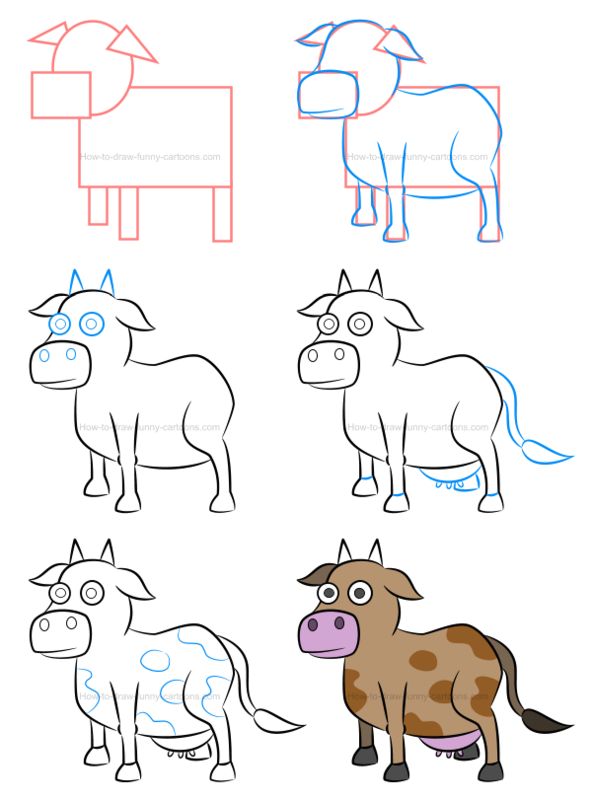 Using a mix of curved lines and circular shapes, you can now draw a few patches on the cow's body. 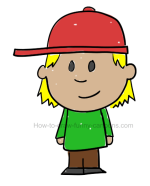 I will show you later in this drawing tutorial how to play with these patches and what is the perfect recipe to create patterns that are visually appealing and relevant to this character. It's now time to add colors inside this illustration of a cow. Of course, cows are often depicted in white while patches are colored in black. 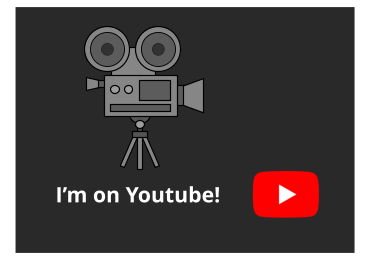 Since we are working with a white background, let's select a light brown color instead. Patches can be brighter while elements that are further in the image (like the tail, the front leg and the left ear) are simply darker. good job drawing this cartoon cow ... but it's not over yet! 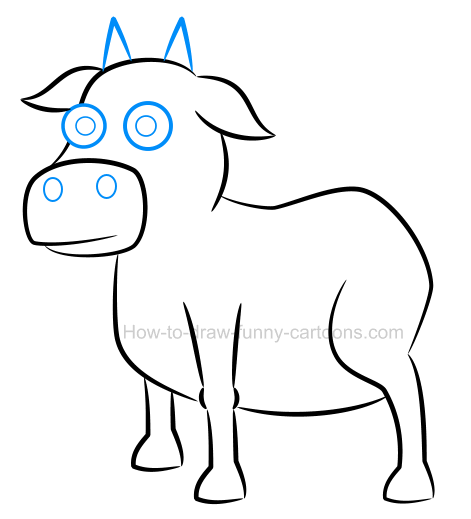 You can see all steps required to draw a beautiful and adorable cartoon cow below. As promised, let's proceed with the second part of this lesson which consists of trying various patterns for the patches in our search for creating the perfect illustration of a cow. This is obviously not a very convincing solution. Patches are tiny and since they are all approximately the same size, it's hard to tell whether these are really patches usually found on a cow or simply dirt visible on the body of the cartoon character. Let's go in a different direction by sketching large patches all over the body. Although this attempt is not a total failure, something is strange about this illustration of a cow. Look closely and you will notice that these patches are quite similar to the ones found on a ... giraffe! Not quite what we had in mind! Patches found inside this third version were drawn using various sizes (which is a good idea). However, the fact that all patches are made from a perfect circle is not recommended. These patches are too similar and the fact that everything is uniform doesn't make the whole thing quite believable. Although the original version was fine, it did not offer as much variety as this new illustration does. The original patches were similar in size and only two different shapes were used. Here, patches are made from various sizes and shapes, which is perfect to create something unique and genuine.